If you hear someone say Puma Golf what immediately comes to your mind? For me, it’s Rickie Fowler, bright colors and unique style. With all the buzz about Fowler and the Puma Golf brand, THP was thrilled when we were given the chance to review their new line. Instead of talking about individual pieces, like we have done in other reviews, we are going to talk about the brand and the line as a whole. We will start with the men’s apparel. 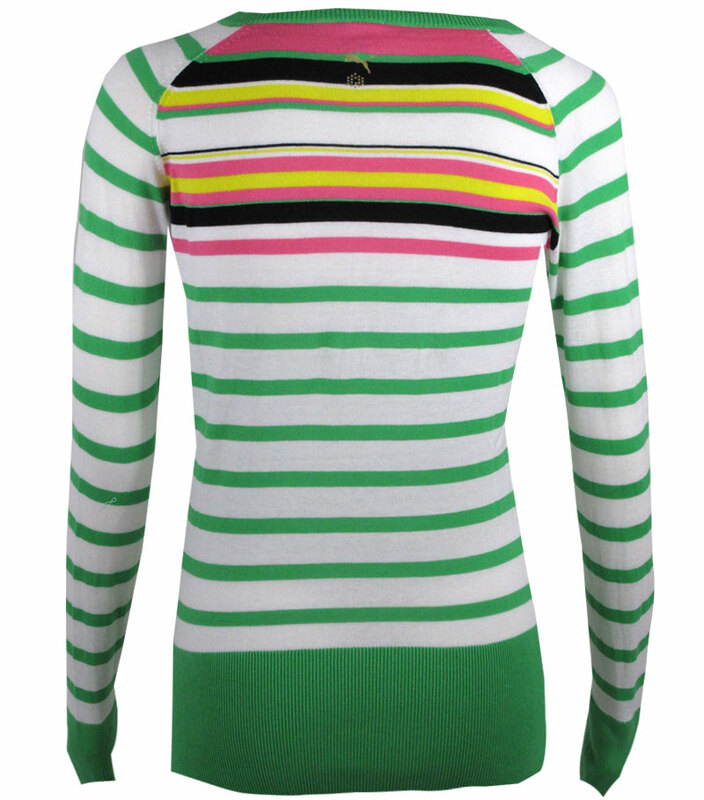 One of the things we love about golf fashion is color, and there is definitely no shortage of color in this year’s line. From blues to greens to even pinks and purples there is a shade for every golfer. 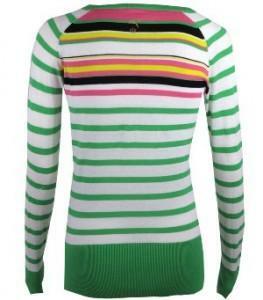 You will also see a vast array of designs from stripes to argyle, as well as, the tried and true solids. What’s great about Puma is that their tops and bottoms are all so bold and unique that they can stand alone by themselves or pair perfectly with another item from the line. Puma is not afraid to pair plaid shorts with a striped shirt, and while that looks is certainly not for everyone, it does help identify a persons individuality, and that I like a lot. Puma used fabulous tech materials, which means function did not have to suffer for fashion, and vice versa. 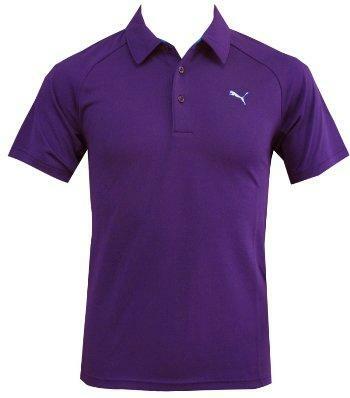 With the use of modern day moisture wicking fabrics golfers decked out in the newest Puma gear will not only look good, but they will feel even better out on the course. They also offer wonderful accent pieces, such as outerwear, belts, of course shoes and we must not forget the hat. We have found that sizing can be a bit of an issue with Puma, and we recommend trying to find a local store nearby to try the clothes on. Overall, though, our group found that the men’s sizes ran just a tad small so you might want to look into going one size up if ordering online. 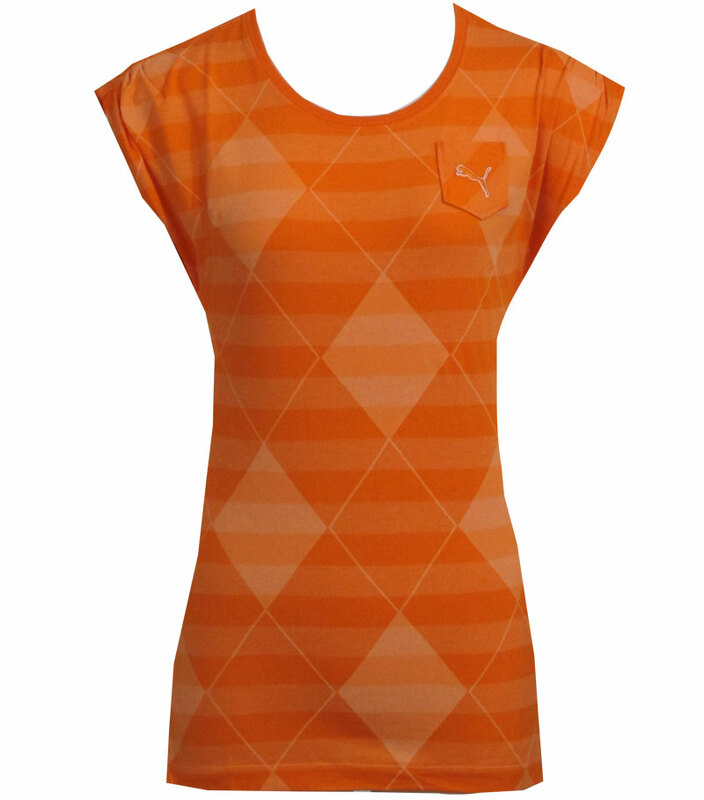 I was extremely impressed with the ladies line from Puma Golf. I loved all the vibrant bright colors mixed with fun patterns and playful cuts and designs. Just like my impression of the men’s apparel, I felt that Puma really stepped it up with their use of color. In my ever day wardrobe I might stick with the more subdued colors like black, white, gray and blue but on the golf course I like to wear the brightest colors I can find. Why not? It’s a beautiful sunny day outside, the sky is strikingly blue, the grass a sharp green and the flowers are all vibrant shades of pink, purple and yellow. So why shouldn’t I fit in with the outdoors? That’s my thought process at least. I may not have any real game on the course, but I still like to dress as if I do. After reading that, you can probably guess that I was a huge fan of all the great shades and patterns that Puma had to offer for this years ladies line. Just like the men’s offerings, the ladies apparel also feature some great moisture wicking technology for staying cool on the course. That isn’t to say that some items were still of the more traditional cotton fabric, rather there was a good mix of both. I really enjoyed all the tops and bottoms and liked that the cuts of the bottoms weren’t too short. 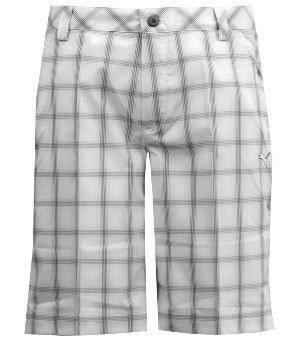 I am a bit modest when it comes to the length of my golf shorts and skorts. I found most of the Puma gear for ladies to be fairly true to size, but I would urge you to try and find a local store and try a few items on if at all possible. There was one portion of the 2011 Puma Line that stood out to me over the rest and that was the sweaters by Puma. They are fashionable yet classic in style, soft, lightweight and incredibly comfortable. I am a firm believer, that if something fits, feels and looks good then you should buy it in every color that is offered. That is exactly what I would like to do with these sweaters. Overall, we were quite pleased with everything we got to test from both the men’s and women’s Puma Golf line. 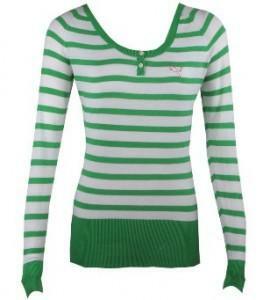 Their use of bright colors mixed with solids and patterns allows a wide range of consumers to enjoy their apparel. Not to mention their incredible shoes, hat, belts and more. Puma has been making a statement on the PGA and LPGA tour and I expect to see them continue that onto every course globally. For more information on Puma Golf you can check out their website at www.puma.com. 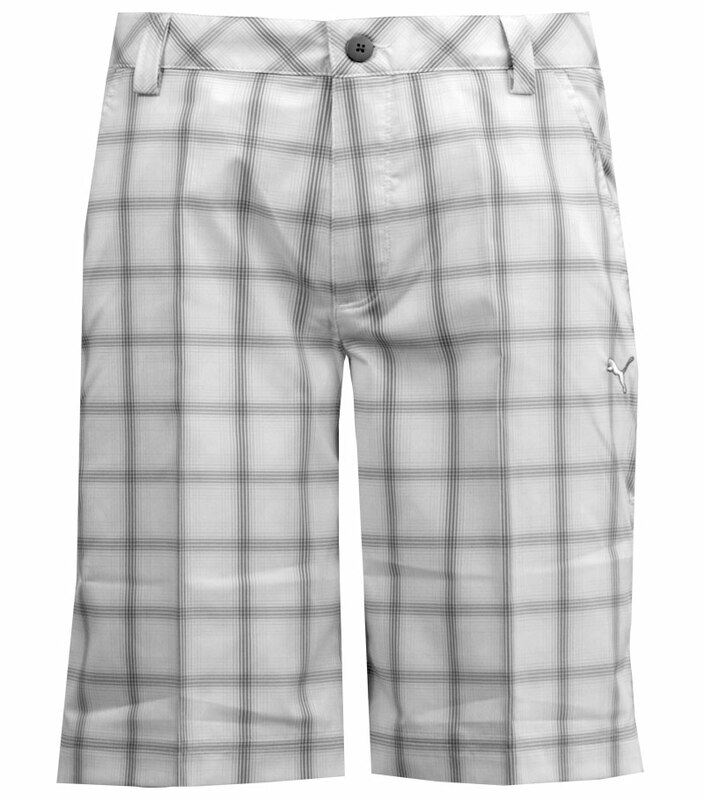 To purchase this gear you can visit your local stores or visit online retailers such as Blind9Golf. I really like what I see from these photos. My wife will really like the women’s line as she is not a fan of the collared look for women – will definitely be sharing this with her! I am digging all the colors; sharp looking without too much “out there”. Thanks for the writeup GG! I really like the Puma solid shirts and their shorts. Love the bold colors and I’ll definitely take a look at them when I’m looking for some new clothes. Thanks for the great review, GG! Great review GG. I’ve always been a big Puma fan, glad to see they’re stepping it up even more this year. Nice review GG. I have really started to like a lot of the Puma gear. I picked up a pair of the Fusion 2 shoes and fell in love. I hope to pick up some of their apparel down the road. Good review GG! I’ve never been a big fan of the fit of Puma’s line but it’s great to see a company step outside the box and offer different colors and prints than what’s traditionally out on the market. Great to see more apparel reviews, especially for such a hot name in the game right now. If the moisture wicking shorts can hold up to the FL weather, that really says something. Great review GG. I like a lot of the offerings in their line and the fact they aren’t afraid to use a little color. I’ve been wanting to add some of their apparel to my closet. Just may have to do that. Thanks again for the solid review. The colors are intriguing to say the least! They remind me of the ’70s colors. Bright and “Here I am”! I love bright colors and the moisture wicking fabrics make a great combination on the course. I’ve always liked their choice in color palette and designs. Love their apparel. The 2011 Puma gear has really won me over. They truly have some of the best stuff out there right now. Bold and colorful apparel is always a good thing in my opinion. Great review GG! Great review GG. Puma has really stepped it up! Nice article GG. I love how stylish the PUMA line is and NOT afraid to stand out and be identifiable. LOVE IT! I also really would like to see my wife in this gear, even if its not on the golf course. HAWT! Nice job GG…. If I were a woman I would wear that Puma Sweater pictured. I think it will be a huge hit…. GG that was a great review! I like how they want to stand out but also offer clothes that fit more my style. Great review GG! Puma really is carving out a portion of the market all of their own! Really impressed by the styling of a lot of Puma’s new pieces. Thanks for the writeup. Puma has to nice looking stuff. I especially like the check shorts and pants. The ladies golf line is very nice. Wife will be shopping that stuff! I wish the shoes had more color options.